Hello readers! I know that it’s been a while since I posted last and I am going to try my best to post at least weekly! I am still baking a lot of delicious things that I want to share with you guys. I have a feeling that I will be baking more and more since I got one of these for Christmas/Hanukkah present…. 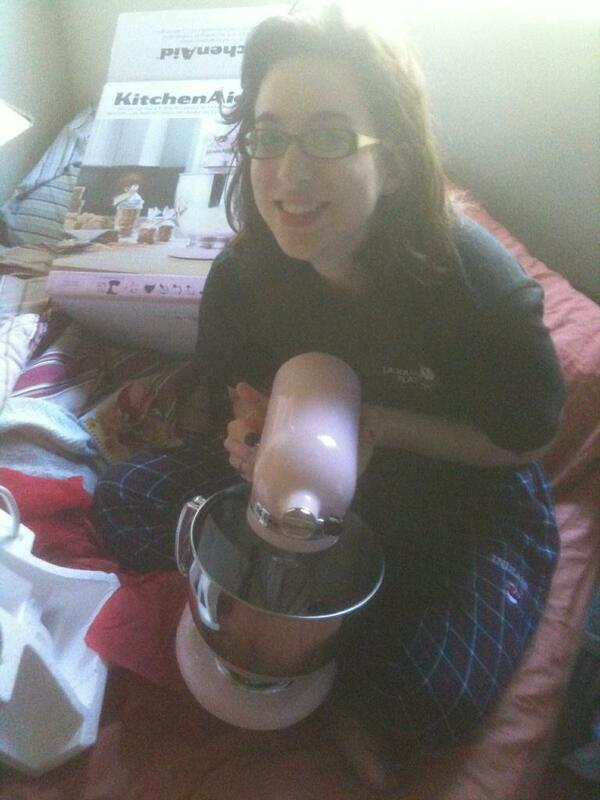 My amazing and wonderful boyfriend surprised me on Christmas morning with my VERY OWN KitchenAid mixer. He even hid the box from me in the days leading up to Christmas so I wouldn’t get suspicious. Is he the best or what?? In a previous post, I said I wanted a blue mixer, but this baby pink one is beautiful, and even better, 10% of the proceeds from the purchase go to breast cancer research. Baking with this beauty, all for a good cause? It doesn’t get better than that. Since I brought the mixer home (taking suggestions on what to name her, FYI) my friends have been sending me tons of recipes, so stay tuned for new posts! Anyone out there have a KitchenAid and have any tips, or fave recipes? How about any attachments? I’m eyeing the ice cream making….